some of my experiences using A123 batteries. I began using A123’s six years ago in a new 40% Carden Extra 300. The initial change for me was not an easy decision, especially considering the increased expense of a new 40% airplane. Lithium Ion batteries had served me well and I really had no intention of changing. Perhaps like you, my preference would be to error on the side of caution and familiarity. One of the first issues I did not fully understand about A123 batteries was there mAH rating. You will notice that A123’s have a far smaller mAH rating as compared to other chemistry’s. It was something that I truthfully did not pay much attention to at first. My initial reaction was that the battery pack would have to be huge to give me the same capacity as my lithium ions. It actually turns out to be the opposite. The reason for the smaller mAH rating for A123 technology has to do with a much higher amount of usable mAH. Typically a two cell, 2500 mAH pack can easily last as long or more than a 4800 mAH lithium Ion pack used in a 40% plane. “How?”. . . you might ask? It turns out that since other lithium chemistries are higher in voltage, the voltage regulator’s dump the excess voltage in the form of heat. For instance, a Li-Ion / LiPo battery tops out at 8.4V and the discharge curve is a slope, so that there is significant time during which the voltage is greater than 6V. 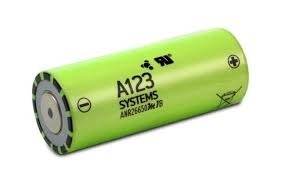 The A123 discharges at a near-consistent 6.6V, there is no need for a regulator, so you get to use more of the battery's capacity. Even with a regulator (for those who want a lower voltage), the voltage difference is less than with Li-Ion / LiPo, so there is less capacity being wasted. 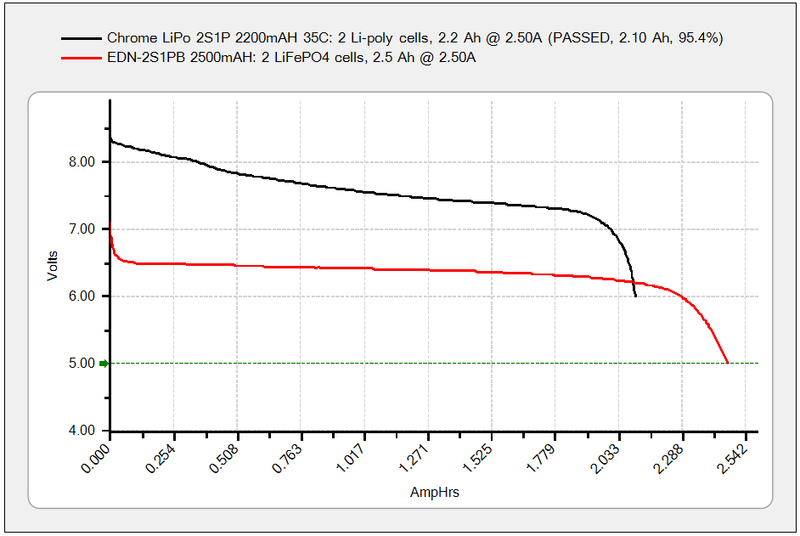 In the chart below (comparing near-similar capacity LiPo vs. A123), assuming a 6.0V regulator, the area between the 6V line and the battery discharge curve is "dumped" as heat. 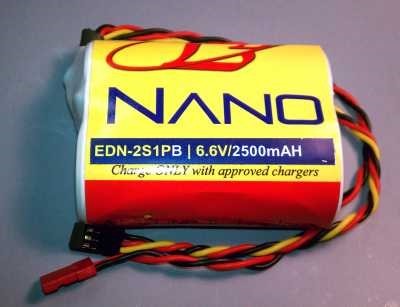 You can easily see that the capacity dumped with LiPo is a lot greater than with A123. With the new HV servos, you do not need regulators, but there is a slight performance (torque/speed) inconsistency from fully-charged to almost-discharged. Some serious competitors may find this unacceptable when striving for accurate maneuvers. I have observed first hand that there are some benefits to having an adjustable regulator on board with lithium ion batteries. Perhaps there is some simplicity in the ability to simply dial up or down the voltage rather than changing servo speed with the radio. I have found that over the years both lithium ion and A123 have both been improving their capacity while keeping the individual cell size and weight the same. A 4s2p lithium ion pack is now up to 5200 mAH (from 4800 mAH) and 2 cell A123 pack is up to 2500 mAH (from 2300 mAH). The good news is that we get to enjoy increased capacity of either chemistry without any additional weight penalty! I get a lot of questions about this so I thought I would share. My goal here is not to say one chemistry or setup is better than the other, rather, it is to share something that has worked well for me over many years. 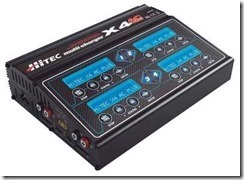 Who knows, maybe there is something here you can apply to your own set up whether it is Lithium ion, A123, Lipo etc. My preference on 35% planes and higher is to use two separate Rx’s powered independently by separate A123 2500 mAH battery packs. The idea being that in the case of a failure (battery, switch, etc.) I still have control of half the airplane. I hate to admit this, but it’s truly amazing how well an airplane will continue to fly if you lose a control surface. As kids on the farm, my brother and I used to play a game with an old Dura Stick plane we had. One of us would fly the airplane back and forth down the runway while the other had so many chances to knock it out of the sky with a mud clod. I’m not recommending that you do this, but I think you get the idea. After so long the airplane would eventually get hit and we made a game of seeing who was the “Better pilot” or “Who had the better arm”. Many times we flew the Dura Stick around missing a working aileron or rudder. It’s really amazing to watch unaware, how well a plane will continue fly without use of an aileron or rudder. I am very confident that if a problem arises, the odds are in my favor to keep the airplane under control using this setup. On planes smaller than 35% I have found it unnecessary to go to the time and expense of dual Rx’s. 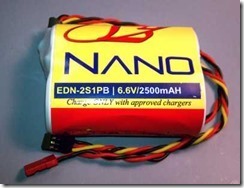 I currently use a single 2500 mAH A123 pack for the Rx and 1100 mAH A123 pack for the iginition on a 50cc gas airplane. Twin cylinder engines can get by with an 1100 mAH pack but quads definitely require the larger capacity 2500 mAH A123 pack to power the additional ignition box. Smaller glow planes do just fine with the 1100 mAH A123 Rx pack. The key is knowing how much capacity the airplane is using per flight. or maybe better known as KISS has served me very well. I use three switch’s total, one for each Rx and one for a fiber optic kill (35% and larger). That’s it. There are no regulators, power box’s, or some kind of power buss. I’m not aware of any setup that has as much redundancy with as few of parts to fail. Each switch electrically isolates each system from possible onboard interference and operates independently. Yes, I suppose there is a remote possibility that you could have two batteries or two switches fail at the same time, but I’m willing to take those odds. In fact, after 5 years of many flights, I did have a power lead break off going into a switch. It turned out that I should have allowed for more strain relief in that area. Apparently I never noticed the problem for a few flights and learned some valuable lessons in the meantime. 1) Always make sure you have plenty of strain relief. 2) Always take a quick look at your switches before each flight 3) Never underestimate the value of using batteries and switch’s with two power leads. 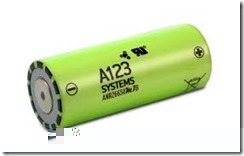 A123 batteries is probably the second most misunderstood subject following mAH rating and usable mAH. For me, and I think most everyone, this is because it is drilled into our heads from day one to “Always load test your batteries before you fly” and the fact that most every radio system out there is sold with an inexpensive wall wart style charger that says “yes” or “no”. It is always a good idea to load test the flight pack(s) and I would mandatorily always include it in any preflight regimen. Even better is using a load tester that tells you individual cell voltage under load (I will get into this more later). Wall wart type chargers do a fine job and are super easy to use. There are however, some fundamental issues to consider. Wall wart type chargers have no ability to tell you how much power you put back into each cell. This isn’t necessarily a bad thing, but you might want to consider why we load test batteries to begin with. Under load, the load test tells us only one thing: the voltage of the battery pack under load. From that, there are only two possible outcomes, low to high state of charge or a bad cell(s). If we continue to charge the battery and the load test remains low, than it is likely that one of those cells is bad and the pack should be replaced. Otherwise we look for a satisfactory voltage under load. This fundamental battery principle applies to almost every battery I’m aware of, Lithium ion, NiMh, NiCd, lipo etc. The problem is that it is not very precise and only takes into consideration the overall voltage of the pack. Consider the possibility that even though you thought that you had enough battery capacity for another flight that the load test only told you that you had “sufficient voltage” in your pack for the next flight. Could there still be a cell in the pack that is failing?? A possibility for a pack to give a false overall load test increases by the number of cells in the pack. 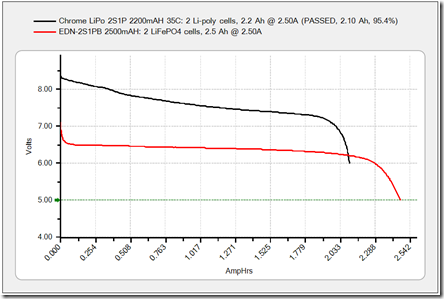 This is why using a charger that counts mAH AND using a load tester that tests each individual cell is important. Well, it’s really a matter of thinking in terms of “You cannot get any more out of the battery than what you put in”. Ok, so you say, “Does this require some sophisticated equipment, knowledge and Calculus??”. The answer is actually very simple. Whoever figured out how to make the first battery probably realized that they needed a way to charge it. So the first answer is, you need a charger that is capable of charging A123 batteries. I personally like using a charger that has four channels, contains it’s own power supply and counts the amount of mAH put into the battery (I will go into this more later). This way you can determine how “Much” you put into the battery. Soon after the first battery was developed and charged, they likely wanted to figure out how much current would be discharged as it provided work (watts). Eventually a conclusion was drawn to keep track of the time it took the battery to do a certain amount of work over several hours until it was run down. This way it was possible to figure out how much work was done over a given amount of time before we would need to recharge the batteries. They called this device a load tester and it measured what the battery was capable of doing in an hour (amp-hour). So the last answer is, you need a load tester. Specifically a load tester that is capable of telling you the individual cell voltage under approximately 300 mAH load. The key to putting this all together is to understand that the charger will automatically count the mAH put into your A123 pack. 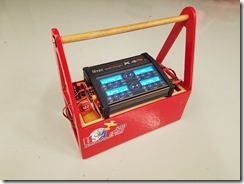 Once you have made a flight you will be able to recharge your battery pack (s) and precisely determine how many milliamps are required per flight. Once this is known, you will be able to compare the amount of milliamps to the capacity of the battery pack. Now you have the ability to reasonably predict how many flights you can fly before exceeding the capacity of the battery (s). No calculus involved. I’m sure my 8 year old daughter could figure that out. Here’s the other good part. You still use a load tester between flights as a double check. 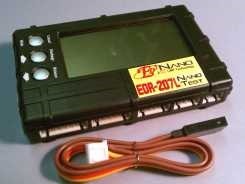 I highly suggest the ElectroDynamics EDR-207L NanoTest A123 Tester or similar because it load tests the entire pack AND each individual cell. So, now you may know what’s going into your batteries and what’s going out and what each cell is doing under load.. Funny thing is, even if you are still questioning A123, you can still use this with almost any other battery chemistry. 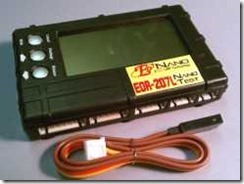 HERE is a great resource about A123’s called “Care and Feeding of ED-Nano batteries”. out there I would like to dispel. There are some “experts” out there who will tell you that you cannot load test an A123. They almost always follow up with explaining that A123’s have a flat discharge curve and you cannot predict when they will fall off. Well . . . not exactly. True, they do have a flat discharge curve (good thing) but no truth exists beyond that statement. The fact is, no matter what chemistry you use these days, they all fall off very quickly. Think of it this way. When was the last time you heard someone say that they thought there lithium ions were “falling off” and they better recharge? Probably never, right? It’s really pretty simple. Keep track of what’s going into the battery pack, load test between flights and be aware of how many mAH are being used per flight. 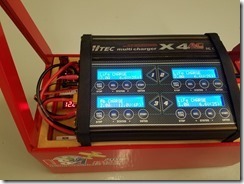 Do this with all your battery chemistries and you will now truly be aware of each cells condition and state of charge. I need a charger that will work for A123’s (they almost all do now) and a load tester that tests each individual cell. We understand that no matter what chemistry we prefer to use they share the same principle, “You can only get out of the battery what you put in”. So how can we apply this more specifically to IMAC competition? 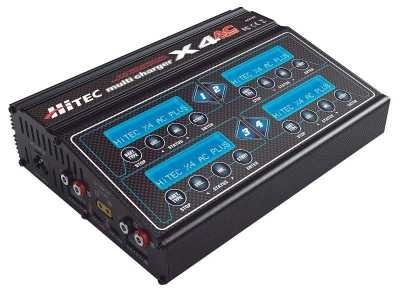 Earlier I mentioned that I liked using a 4 channel charger. Here’s why. When we go to contests they are typically two day events. I like to have the ability to charge my airplane quickly at the end of the day and my airplane has three battery packs (all A123 packs). I have three of the channels set to A123 and the last one set to PB or better known as a gel cell. A123’s are unique in that they can be charged very safely at a fast rate so I am able to use three of the channels to charge the entire plane in one sitting. I typically charge at a 2 amp rate so it usually only takes 30 to 40 minutes to complete charging. I could charge at faster rate but it’s not really necessary. I prefer to always balance charge my packs for maximum life and most chargers are limited to two amps in the balance setting anyhow. Four channel chargers save a lot of time and even if you don’t need as many channels they are very handy to use on battery powered fuel can’s and other support equipment we use at contests. They cost a little more, but I think most people would agree it is worth it. I went a step further and made my charger portable. If you noticed earlier I mentioned having a charger that had it’s own power supply. This is really handy, especially as compared to using a cigarette lighter. I had a friend make me a simple wood box, similar to what we would use to support a glow plane. In the box I have a 12 Ah gel cell, and on top I strapped the charger down with Velcro. Later I installed a female banana jack port, switch and digital volt meter. Now I am portable and have more than ample capacity for an entire weekend of flying. I can charge anything I need too, including the gel cell inside the box. (That’s why I leave one channel set to Pb). During the NATS or extended type contests like the Worlds where I needed to charge the gel cell, I simply take the portable charge box back to my hotel room and use the built in power supply to charge the gel cell. That’s it! A very handy and simple charge box that has everything I need in one hand. I hope you find this article helpful and are able to apply these easy fundamentals to your particular setup.